This week we are starting our penguin unit! Love Deanna Jump's unit. During reading/writing time, we started reading the Tacky the Penguin books. So funny! The kids love him! Anywho, the big line is "Tacky was an odd bird." So I thought it was a perfect time to introduce even/odd numbers. We have done a little bit of fair sharing already, so they are comfortable with the idea of equal groups and left overs. I started by reading the books "If you were an odd number" and "If you were an even number". Then we did a partner demonstration. I asked five students to stand up and asked them all to find partners. When there was one person left out, we knew 5 was an odd number. We did this a few times with different numbers and different kids. We drew this chart to help us show that odd numbers have one left over, while even numbers have equal partners or could be split into two equal groups. Then we talked about bigger numbers and how to tell if it was odd or even (by looking at the number in the ones place). On the pocket chart, I put the labels odd and even across the top. Then I put the green odd numbered cards underneath the odd title and the blue even numbered cards underneath the even title. Then we sorted the number cards underneath the title. After we get good at this, I will remove the green and blue cards and have them sort the cards on their own. If this could help you, I have uploaded it to TpT for FREE! 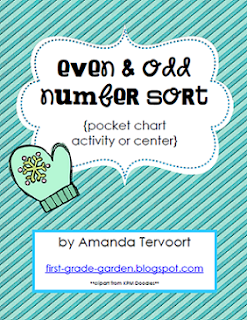 Included is the even/odd title cards, the blue and green helper cards, number cards from 1-50, and two worksheets (one with pre-made numbers and one blank). Click the picture below to download. Well that is it for today. I'll try and remember to take some pictures of all of our penguin activities this week. Good night everybody! This is awesome. Thank you so much for your generosity! I think this will really help my kiddos. Love the graphics! Thanks for sharing. Very cute! I have the same graphics and this will go great with my math stations. Thanks for sharing, love it! what a great and robust lesson! Lovely Amanda! amazing ideas about even and odd. i am teacher trainer maths and i shared your ideas with many other teachers. Thanks for sharing.